CLOCKWISE FROM LEFT: Kota Kakutani (cutter), Paula Avellandea (seamstress), Marcus Brown (cutter), and John Weber (production manager); the accessories line; a signature leather jacket. Langlitz Leathers started with an accident and a bad idea. First came the accident: In 1935, 17-year-old Ross Langlitz was on his motorcycle when a drunk driver backed over him. Doctors amputated his leg and told him he’d never ride again. Then, the bad idea: Langlitz ignored them. He rode on. He sewed his own jackets, which became so popular among his biker friends that he founded his own custom motorcycle jacket company in 1947. 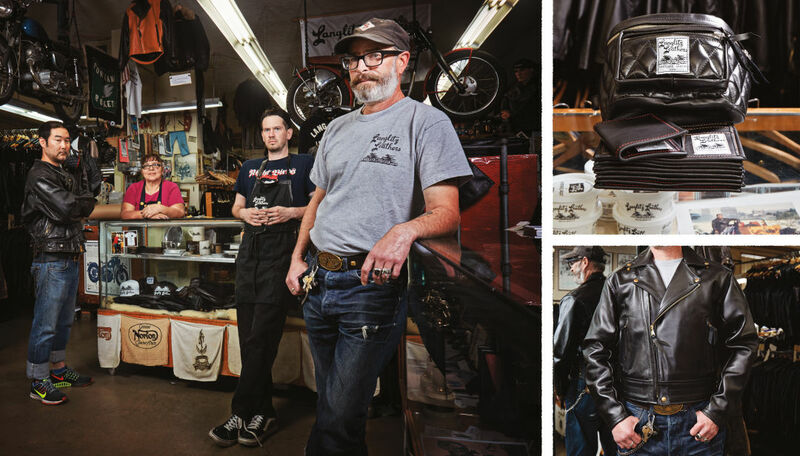 Smith says Langlitz jackets are made for rainy, windy Northwest rides, and for riders like Ross Langlitz—the kind who don’t wait for sunny days, who feel the call of the road, and don’t let anything get in their way.